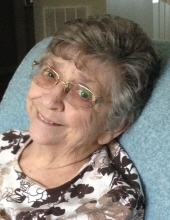 Peebles, Maureen Rita Rivette - Age 88 of Hendersonville, TN formerly of Flushing, died April 12, 2019. Funeral services will be held 1 PM Tuesday, April 23, 2019 at Sharp Funeral Homes, Miller Road Chapel, our temporary location at Hill Creek Church 5363 Hill Road, Swartz Creek. Visitation will be 1 - 8 PM, Monday, April 22 at the church. Maureen was born June 27, 1930 in Davison, the daughter of Benjamin and Aurelia (Pickard) Love. She married Harry Peebles on May 1, 1986 in Grand Blanc. He preceded her in death on April 25, 2009. Maureen worked at AC Spark Plug. She was a member of the Red Hat Society. Maureen is survived by her children, Laura Miller, Kathryn Levas, Timothy Rivette, Patrick (Mary Jo) Rivette, Judy Baldwin and Francie Hart; step-children, Kenneth Peebles and Douglas Peebles; 15 grandchildren, 15 great-grandchildren; sister, Patricia (Boyd) Gilchrist. She was preceded in death by her parents; husband, Harry; brothers, Duane and Terrance Love. Tributes may be shared at www.sharpfuneralhomes.com. To send flowers or a remembrance gift to the family of Maureen Rita Rivette Peebles, please visit our Tribute Store. "Email Address" would like to share the life celebration of Maureen Rita Rivette Peebles. Click on the "link" to go to share a favorite memory or leave a condolence message for the family.